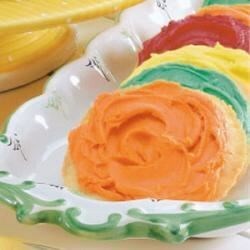 "'These soft cookies are always a hit, so I often stir up a big batch,' writes Coleen Walter of Bancroft, Michigan. 'I usually add food coloring to the frosting to coordinate with the current holiday.'" In a large mixing bowl, cream butter and sugar until light and fluffy. Beat in the eggs, vanilla and almond extract. Combine the flour, cream of tartar, baking soda, salt and nutmeg; gradually add to creamed mixture. Drop by rounded teaspoonfuls 2 in. apart onto ungreased baking sheets. Bake at 350 degrees F for 8-10 minutes or until light brown. Remove to wire racks to cool. For frosting, in a large mixing bowl, combine the butter, confectioners' sugar, almond extract and enough water to achieve desired consistency. Tint with food coloring if desired. Frost the cookies. these cookies turned out awsome for christmas, i used cookie cutters instead of a spoon, next time i better make twice as many!